199 Reasons Why It's Just Not Working Out. If you're tired of making yet another weight loss related New Years Resolution, look no further! This book will solve your issues once and for all -- Promise! 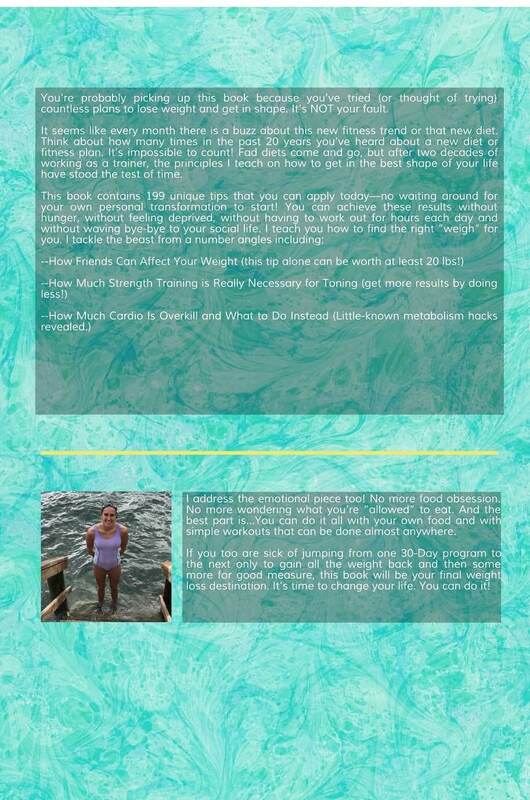 In this book, I share information previously only available to my personal training clients for the very first time. Listen to an Interview about Change Your Weighs with Frank Novak on Point of Reference. You’re probably picking up CHANGE YOUR WEIGHS because you’ve tried countless plans to lose weight and get in shape. Every couple of months there is buzz about this new fitness trend or that new diet. Think about just how many times you’ve heard about a new diet or fitness plan…It’s impossible to count! Let’s call these quick-fix plans what they really are: A big. fat. distraction. They lead to struggle and feelings of shame. Aren't you tired of it? Fad diets come and go, but after two decades of working as a trainer, the principles I teach on how to get in the best shape of your life have stood the test of time. The best part of CHANGE YOUR WEIGHS just might be the “Pro Tips” sprinkled throughout that will really serve to up your game. No more going shopping for yet another bigger size of clothes. No more food obsession. No more wondering what you’re “allowed” to eat. And the best part is...You can do it all with your own food and with simple workouts that can be done almost anywhere. I know you are sick of jumping from one 30-Day program to the next, only to gain all the weight back and then some more. This book will be your final weight loss destination. Your journey to putting all of your fitness baggage in the rearview mirror begins. right. now. 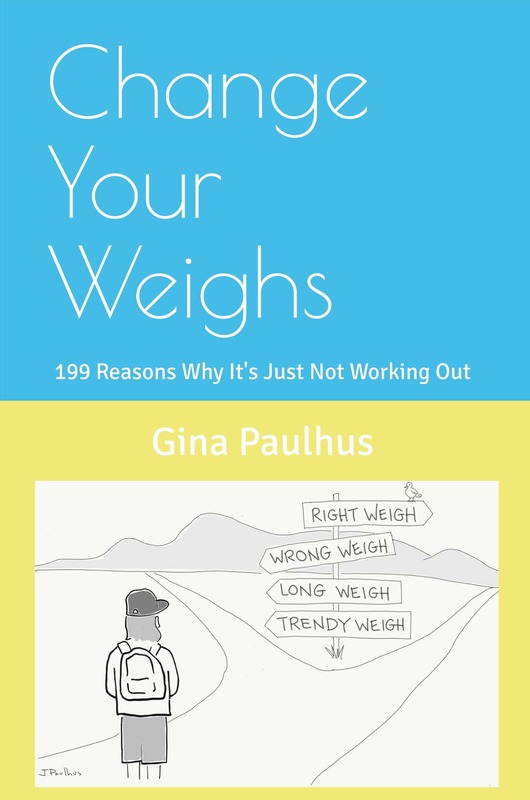 "In Change Your Weighs, author Gina Paulhus has compiled a comprehensive collection of the many reasons that one might not be reaching their goals in weight loss and fitness. 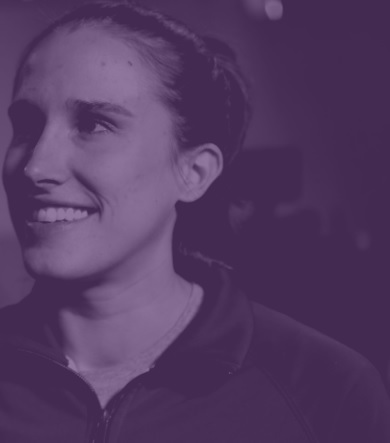 Then she provides clear and practical solutions, often backed up by solid science that helps the reader see what is going on "under the hood" with their bodies. There is a LOT of information in this book—calories are counted and pounds are weighed—but somehow Gina manages to fit it all into an easy-to-read book. It covers diet and supplements, detailed workout plans to maximize weight loss, and even social factors and attitudes that affect one's success in achieving their fitness goals. The book's tone is uplifting and encouraging throughout, and Gina's sense of humor and wit are on display as well. Many of the tips in this book were a revelation to me. For example, "diet" foods and drinks and "sugar-free" gum may actually contribute to weight gain because of the sugar alcohols used as sweeteners. Also, she continually stresses the importance of weight training in losing weight (and not just for building bigger muscles). And her "prescriptions" for diet and supplements are carefully chosen for maximum benefit. Gina's many years of experience really come through in her book, and she writes with the authority of an expert in her field, who has thoroughly tested the methods she prescribes. Change Your Weighs helped me identify a number of errors in my thinking and actions that were impeding my progress. I feel as if the path to my goal is much clearer now, both in my mind and in my fitness action plan." Reading this book is like having a casual conversation with an expert. I love the format - short topics full of answers from someone with years of experience. A very easy read - packed with bites of information I don't choke on. Sometimes I just want an answer to a question and don't need huge volumes of information that I don't necessarily want or understand - this book has the answers without all the confusion and background noise. Thank you!! “Change Your Weighs” was such a refreshing change from all the other weight loss books I’ve read before (and there are many!) Gina is engaging, funny and compassionate as she details the various reasons a person might struggle with his or her weight. She provides a variety of solutions for many of the issues at hand. There is truly something for everyone in this book. Whether you’re a couch potato at heart or a weekend warrior athlete who wants to take control of your weight, this book won’t disappoint. 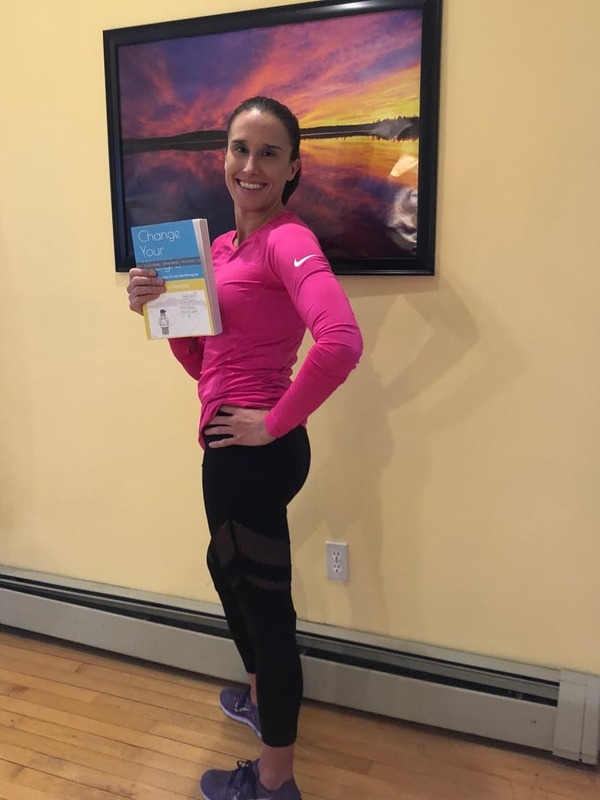 I am glad I purchased the paperback as I plan to go back to it over and over as I continue to work on changing my body and improving my health. This book was a total game changer for me! There is so much great information and I love the way it’s organized. You can read cover to cover or skip to the sections you are most interested in. All the information is easy to follow and implement into your daily life to achieve a healthier lifestyle! This book is very different to the usual diet books I have spent my life reading time after time. Non of those have made an iota of difference to my weight it has still gone up and down over the years. I am hoping this one will finally make a difference. it is much more centered on common sense and attitude with sensible advice one can dip into time and again as and when needed. This book is a direct, easy to follow, but an in depth way to look at how to change your habits. Written with a realism that hey, life happens and people make mistakes, it also discusses how to get back up on the bandwagon after falling off. It helps with people who may be new to exercise and healthy diet, or people who may already be knowledgeable who need some extra little pointers (BTW, the color coding idea is great!). It also stresses some points over so that you kinda get that idea that hey, maybe that point WAS important! There was even exercise lists/ideas to do at home, so you have no excuse to not just bookmark a page of the book and there are some exercises to do! "This is not just another garden variety dieting book. There are no recipes or workout lists. Instead, this book goes deeper. It teaches you how you can create your own diet and workout based on your personality, your schedule, your needs and your goals. I love how it’s organized by section, meaning that Food tips, Workout tips, and Attitude tips are all found together. This way I could start reading where my own personal issues fall and reach the other sections as needed. I also love the Pro Tips. They were truly unique and in spite of all the diet books I have read, many of them I had never seen before. When you follow the advice in this book, weight loss happens kind of like a side effect versus an obsession. I am so thankful to have found it. For the first time in my life I don’t feel like I need to “go off” the diet because it’s not a diet. It’s a lifestyle transformation." Looking to Change Your Weighs? Gina's first book, Mind Over Fatter, came out years ago. But the information is still just as useful today! Check it out. Have YOU Read Mind Over Fatter? Drop comments about it below. We love hearing from our readers!